Last week I had the pleasure of attending Music Group's 25 Anniversary celebration in Zhongshan, China. Music Group is the parent company of brands like Behringer, Midas, Turbosound, Klark Teknik, and Bugera. I had never been to China before, so when I received the invitation a few months ago, I jumped at the chance to experience this ascendant nation and discover what Music Group was all about. Although the trip was only three days long, I came away with quite a different impression of China than I expected, and was also very impressed with Music Group as a company. Here is a photo essay of my journey. 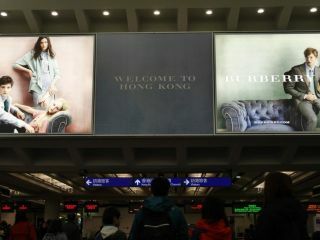 I arrived in Hong Kong after a 16 hour flight. Even though I departed New York at 9am on a Wednesday and arrived at 2pm on a Thursday, I felt far less disoriented than I had anticipated. From the Hong Kong airport I hopped on a ferry that took me to Zhongshan, a city I'd never heard of before. Just for some background, it is in the Guangdong province pretty close to Shenzen, which is one of the major factory hubs of China. It was an hour and a half ferry ride from Hong Kong. The most impressive thing about this journey was that my bag was checked straight from my plane onto the ferry, without my ever having to touch it. We were greeted at the Zhongshan ferry terminal by some young Music Group employees. I was one of the only members of the press on the trip—the rest were Music Group employees and partners from around the world. I would estimate there were about 200 of us. We were all taken to the King Century Hotel, which displayed a big banner announcing our arrival. These banners would welcome us at nearly ever stage of our three-day journey. The hotel was very fancy and modern. After a surprisingly restful sleep considering the dramatic time adjustment, we all piled into three buses and headed to Music Group City—the company's future factory that is currently under construction. The scope of the construction is difficult to convey in photos. It's a $100 million investment in the company's future. We all had to wear hard hats. Here's a view of the construction from the roof. Not only will Music Group City house the company's factories, it will also supply dorms for the factory workers, with room for up to 10,000 workers after the completion of phase two. It will also house a large chunk of the company's R&D, which is already established at the current factory in Zhongshan. This is what Music Group City will look like once completed. It is currently the largest industrial project in Zhongshan, with 700 people working to finish it by the end of the year. It was designed by CEO and founder Uli Behringer. This is Aris, who works in the graphics department at Music Groups headquarters in the Philippines. As with everybody I met with the company, he was very friendly and welcoming. Here's another view of the construction. Music Group is currently a roughly $300 million company, but Mr. Behringer is reportedly aiming to bring that up to $1 billion. After the construction tour, I took the opportunity to see a bit of Zhongshan. It was unlike anything I ever expected to see in China—the palm tree-lined streets reminded me of something out of Southern California. It is the fifth largest city in Guangdong, with a population of around three million. The city struck me as very cosmopolitain, with lots of attention paid to grooming of outdoor spaces. It even had a bike share program, and was outfitted with an accessible network of bike lanes. There was also an extensive recycling program—these were on almost every corner. And, of course, there was a beautiful Starbucks. The next day we went for an extensive tour of Music Group's current facilities. Before the tour, everyone gathered for a family photo. This photo includes all the guests in attendance from around the world, and also the staff currently working in Zhongshan. The factory tour was impressive. I took well over 100 photos, but don't worry, I'll only show a few of them here. In this picture, workers are testing Midas mixers. The factory did not fit into my pre-conceived notions of what a Chinese factory would look like. It was pristinely clean, and all of the workers seemed relatively upbeat. Music Group has a high retention rate of factory employees. They are rewarded for bringing any flaws in production to their superiors' attention, and are provided with free room and board. The facility manufactures roughly 150-200,000 products per month, but at peak times they can crank out around 500,000. At the new facility, that number is expected to double. In total, there are 3,000 factory workers currently employed. One problem that many factories in China face is the non-return of workers when the country pauses for Chinese New Year. Music Group has an 80-90 percent retention rate, which is reported to be remarkably high. These are some of the dorms where the factory workers live. Note the absence of suicide nets on the roof. This is not Foxconn. We got to watch the assembly of a loudspeaker from start to finish. Here they are in a more finished state. I splurged on a new camera for the trip. I'm not going to plug the brand right here, but it really took spectacular photos. If you want to know more, Twitter at me. The finishing touches being put on a Bugera amplifier. All the tubes are aged and tested for 48 hours. The testing of every product during every step of the manufacturing process was constantly emphasized. It's hard to imagine any lemons coming off the Music Group assembly line. While I applaud Music Group's standing desk ethos, I would probably recommend better footwear for at least one of its employees. After the factory tour we got a glimpse into the on-site R&D department, where I was allowed no photos. Music Group has around 300 engineers all over the world working on R&D, but a large chunk are housed right there in Zhongshan. Uli Behringer's unassuming office was right there on the R&D floor, and he reportedly spends about 80 percent of his time on site. The advantages of having R&D directly adjacent to manufacturing was stressed repeatedly—the team can go from concept to prototype in around 24 hours. If flaws are discovered, they can quickly make adjustments. It struck me as a very nimble operation, and the fact that the CEO sits right next to his engineering team speaks to his hands-on involvement. It's not hard to see why the company was able to deliver 141 new products last year alone. After the tour, we were all treated to a speech by Mr. Behringer—a youthful looking guy for someone who founded a company 25 years ago. Behringer struck me as an inspiring, entrepreneurial, and energetic CEO. His optimism was infectious, and could be felt throughout his staff. During his speech, Behringer took us on a tour of his company's history—from its beginning in 1989 with 20 employees up to the 3,500 it employs today. He touted the Behringer x32 as the best selling digital mixing console of all time, having sold 150,000 units in the last two years, and repeatedly highlighted the company's focus on R&D. The company boasts the largest R&D in the industry, focusing relentlessly on innovation and making, as he put it, "insanely good products." Behringer made no secret of his quest to be the very best in the audio industry, and thanked his employees and partners from the bottom of his heart. The day was capped off with a gala celebration the likes of which I have never personally experienced, red carpet and all. Inside, all 3,000 factory employees cheered us on as we entered the celebration. The whistling and clapping was almost deafening. These were all the people I had seen hours earlier hard at work, now celebrating us with genuine enthusiasm. It was truly breathtaking. They all lined the red carpet, waving and taking photos like we were celebrities. When Behringer arrived, the response was overwhelming. I guess that in China you never know, but the enthusiasm and adoration of the workers struck me as positively genuine. Behringer gave another speech, paying great tribute to the Chinese people and constantly thanking his employees. The optimism and enthusiasm was even higher than the speech he had delivered earlier in the day. During the party, we were treated to a variety of performances by the factory workers in various capacities. From different forms of traditional Chinese dance to an impressive chorus. The whole gala had the vibe of an awards ceremony meets a high school prom. Everyone in attendance seemed blown away by the scale, and the workers especially seemed in a proud and celebratory mood. The night was capped off with lots of confetti and thanks from the hosts. But invited all of the attending employees up on stage to share in the spotlight. The move was emblematic of both the humility and devotion to his company that Behringer displayed throughout the entire anniversary event. He has a vision, he's incredibly hungry and energetic, and he seems to do a remarkable job of infecting all levels of his operation with that same spirit. Although I was only there for three days, I left China with much to ponder. Zhongshan as a city was unlike anything I ever expected to find in the country. Even though my Twitter and Instagram wouldn't function, nobody there seemed anything less than happy and normal. Everywhere we drove we saw massive construction projects. There was an unmistakable feeling of optimism in the air. This optimism was certainly heightened by Uli Behringer and the countless Music Group employees and partners I met along the way. While my opinion of the company was largely neutral prior to this journey, it would be impossible to come away from this event anything but enthusiastic and very curious to see what the company has in store for the future.